SAP S/4HANA Cloud provides a tailored end-to-end solution to run your professional services business on the digital core with cloud benefits. Project managers benefit from a rich set of functionalities and a completely new user experience to effectively run their projects steered based on real-time financial performance data. At the same time, business analyst can steer the financial performance of dedicated market segments based on real-time data. 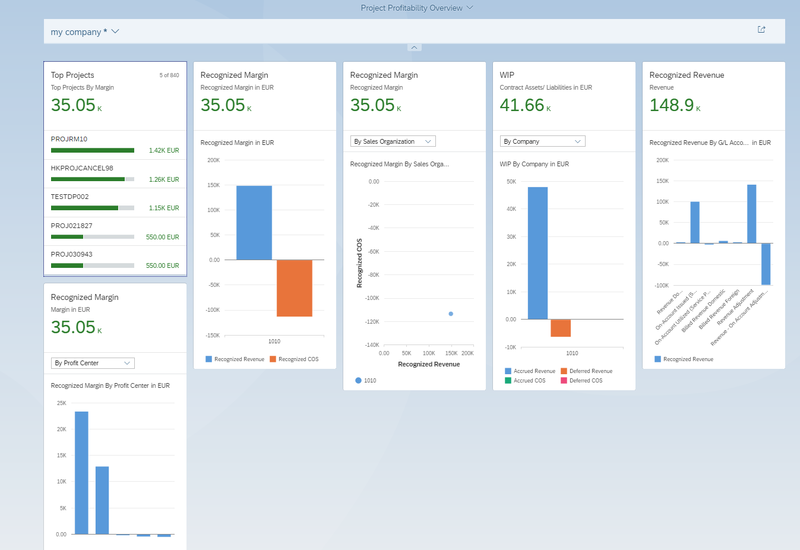 In this blog series, Stefan Walz and I would like to provide you with background information on the design, main elements, and benefits of Financial Accounting for Customer Projects in SAP S/4HANA Cloud. Simplified period-end close: The settlement of customer projects is no longer necessary. All profitability and professional service specific attributes are provided in all project-based line items, even in the revenue recognition line items. This makes settlement obsolete. All financials data of the customer project related business transactions are stored in real time in the Universal Journal and thus reconciliation effort is no longer required. Matching principle for cost and revenues: Current project and market segment margin as well as work in progress (WIP) data is always provided. Enhanced financial reporting features: all KPIs like ‘profit margin’ are calculated based on G/L line items in the Universal Journal as single source of truth. Profitability attributes such as project, customer and sold product are automatically derived from within the business process. With HANA a reporting on the G/L line items is possible, which allows reporting on all provided attributes within in the Universal Journal. In the project based service scenario cloud capabilities like simplified business processes and Best Practice content meet the power of the Universal Journal and event-based revenue recognition. This allows new reporting in real time – out of the box. The data in the report is based on G/L line items, which enables a drilldown on every Key Performance Indicator (KPI). These reporting capabilities are embedded within SAP S/4HANA Cloud; hence the figures are always correct and up to date. And there is no additional period-end close required to ensure matching of revenues with related costs as well as market segment enrichment. Cost rates can now be maintained very flexibly – and from SAP S/4HANA Cloud 1805 very comfortably: typically for Professional Service based on ‘who provides’ the service. For example, this can be by single employee or of the grade level of the employee. In addition, you can maintain intercompany rates, which subsequent leads to an intercompany margin posting. As it is often required that an employee creates a time entry for a working day, for which the posting period in financials is already closed, we now introduced the service rendered date to ensure a consistent process. To distinguish the type of employee in reporting by ‘own employee’, ‘intercompany’ or ‘subcontractor’ we introduced the new attribute Resource in ACDOCA of the Universal Journal. Although a customer contract is always applied to one responsible Profit Center (PC) / Partner, there will be confirmations of employees from other PCs too. We are now able to drill down contract margin/revenue by all contributing PCs. Therefore, we applied a new reporting attribute in ACDOCA, the origin Profit center. To enable this kind of reporting for fixed price contracts as well, we developed a new functionality in revenue recognition by posting additional line item with the G/L account Target revenue. Employee profitability information is very important for the Professional service industry. We now apply employee information in case of T&M contract in billing line items and in all revenue recognition postings, in case of fixed price we use target revenue too. To identify a confirmation as ‘non-billing’ relevant, there is a new attribute Billable control available now in financial reporting. With T&M contracts, it also controls whether an item will be billed. The activity type/role defines the requested service – such as ‘senior consulting’. To define what is provided – training, testing, and so on – we introduced the new field work item, which is assigned in ACDOCA and part of the coding block. Thus it can be used for time and expense postings. From SAP S/4HANA Cloud 1805 onward, the cost rate can be maintained dependent on this attribute. In this blog Rene Kirchhoff and Stefan Walz would like to show you how SAP S/4HANA Cloud enables customers to get hierarchical market segment reporting based on profit centers, which are the key reporting attribute in the service industry. Aggregated reporting and hierarchies can be built based on profit center attributes – including extensibility fields. They show how reporting looks like and the step-by-step approach for achieving it, and how easy it is to define various hierarchies and manage the profit center attributes. They will also show how to update the profit center attributes if for example a profit center reorganization takes place.